Powers/Abilities: Tar-Vash is a trained military man. After his evolvement into the Ruul, he possesses the capability of evolving his body into several different forms to survive in varying environments. He wielded Pacifier units and the Starwheel in combat, and commanded others. (Defenders II#8 (fb) – BTS) – A Kree military man, Commander Tar-Vash was ordered to pacify the border planets or the Empire. He worked hard to bring glory to the empire, using a powerful new weapon, though he had to delay his appointment to be transformed into one of the Ruul due to his duties. Piloting the powerful Starwheel, Tar-Vash captured the Starwheel from the Yang moon, where the Yang live. 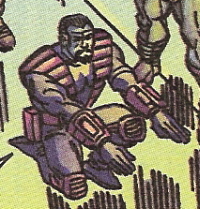 (Defenders II#8) – Commander Tar-Vash kneeled before the Supreme Intelligence, introduced by Ronan the Accuser. Ronan used the Universal Weapon to channel the Supreme Intelligence’s ability, and evolved Tar-Vash into one of the superior Ruul. Tar-Vash was commended for his efforts in the war. He soon returned to Trellnex-3 and attacked the Toad Men and the Defenders (Doctor Stephen Strange, Hulk (Bruce Banner), Silver Surfer, Sub-Mariner), with a contingent of Pacifier units, Tar-Vash himself in one. The Defenders fought the Pacifiers, destroying many, before Tar-Vash empowered them with the Power Cosmic from the Silver Surfer. 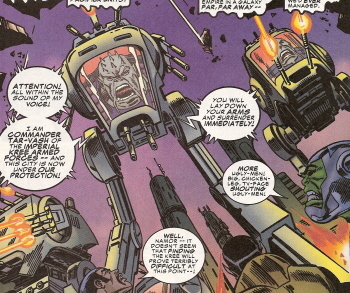 The Defenders were soon captured in bubbles generated by the Starwheel, and Tar-Vash taunted them, goading the Hulk, whose strength increased and allowed him to escape, destroying the Starwheel and defeating Tar-Vash. 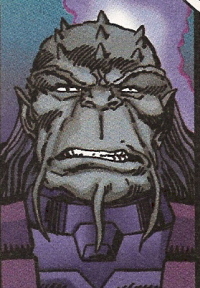 The Kree/Ruul retreated, and Tar-Vash was disgraced back in Hala, the Kree/Ruul homeworld. Comments: Created by Kurt Busiek, Erik Larsen, Ron Frenz, and Al Vey.